The Promos: First up, the giveaway, since we know that is what’s up. Saturday against the Marlins, you can get an “eco-friendly tote” thanks to Natural Balance Pet Foods. Friday night, against the Marlins, buy a seat on Scoreboard walk for $20, and you’ll also get a drink voucher for the Scoreboard Walk bar. Cheap Tickets: While the $1 tickets for Monday’s game against Pittsburgh have sold out, you can still get $1 parking in Lot HH, as well as $1 hotdogs, $1 peanuts and $1 popcorn while the concessions still have them. Tickets start at $10 for Monday. 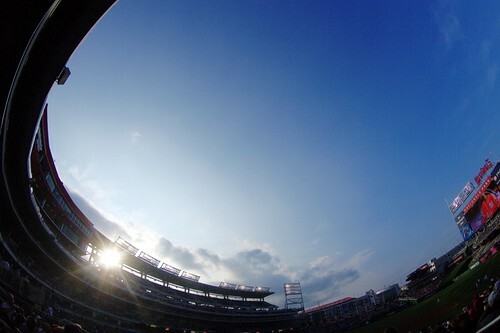 As a followup, the Nats are doing a $2 Ticket Tuesday for the 1:05 midweek day game, which means the outfield corner seats are $2, as well as the LF/RF Mezzanine seats, and the Upper Infield Gallery seats. What better reason than that to skip out of work at lunchtime for a game? Neat Stuff: Friday night Lloyd Dobler is playing Scoreboard Walk before the game. Saturday, if you want to bring your dog out to the game, you can add your furry friend for $5. Sunday, they’re honoring local youth baseball and softball leagues. Do the leagues a favor and bring gloves, balls, bats or helmets that have been gently used and they’ll go to the Banneker City Little League, as well as a $5k donation for them to buy new stuff, tooo. Oh Right, and the Baseball: The Nationals, after being swept in Philly, have put together back to back road series victories for the first time since June of 2007 when they beat the Orioles and Twins on the road. Friday night sees Tom Gorzelanny take the mound, coming off a pair of superlative starts for the young pitcher. He outpitched Madison Bumgarner of San Francisco, and Chris Volstad of the Marlins, neither of whom are exactly slouches. Look for him to rematch Volstad Friday night. While Livan Hernandez took a bit of a beating against the Marlins last Sunday, look for the wily veteran to post another day of junkball against Florida, perhaps with better results. Sunday brings up Jason Marquis, who is a bright spot this season, with a 4-1 record and a 3.66 ERA and WHIP under 1.4. Considering last season he was 2-9, it’s hard not to be happy for the veteran right hander. The Nationals’ offense has been on the mend over the last few days, with Sunday’s mauling at the hands of Florida notwithstanding. A pair of extra inning wins (they’re 4-1 in extra innings) against Florida and Atlanta certainly shows a team with more poise and determination than we’ve seen in the past. Both the Marlins and Pirates have shown some spark this season, but the Nationals definitely have a chance to make this a strong homestand. See you at the ballpark!